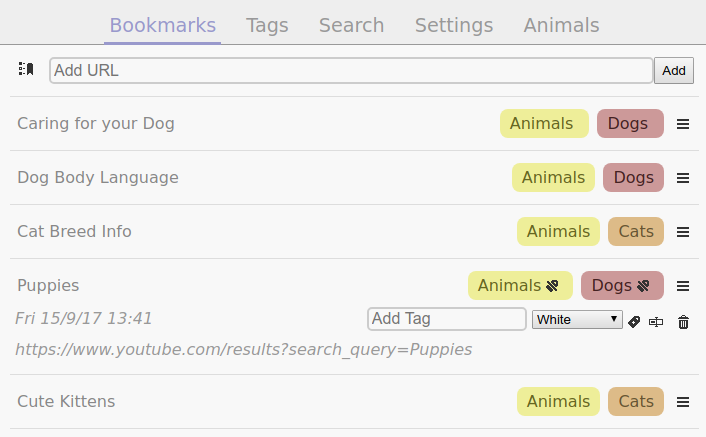 Tag bookmarks in order to categorise them. Colour-code these tags, and add them to the navigation bar for easy access. Allow tagging a bookmark with one tag to apply related tags. Automatically tag a bookmark based on its URL when you add it. Search your bookmarks and tags. Add bookmarks directly from a site using a browser extension. No social media integration; there are no "share" buttons telling you how popular your private bookmarks are. You can create a test account to try out the application without creating a login. Be aware that it will be deleted after a few days, but if you like the site, you can convert it into a full account by providing a username and password.